Classic ink with glitter added. Love to dazzle? These daubers are 3oz (80ml) in size with a standard tip that is easily removed and replaced. You can now purchase the glittery magnificence of Dazzle's by the six pack for a discount! The six pack will contain the same size and type of daubers. This is a package of random colors. 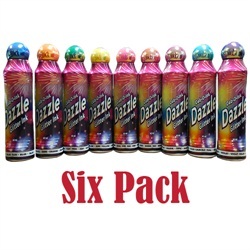 All six daubers will be 3oz Dazzle daubers.